We are proud to present premium quality Mccartney Bottle with screw cap that are made from extra ordinary glass that offers durable and long lasting structure to them. The supreme bottles, are praised by our clients for neat and clear finishing. 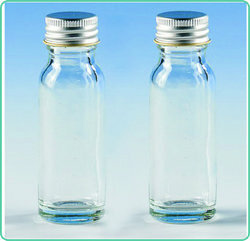 The superior Glass bottles, offered by us, come in different sizes for easy comparison. Glass, wide mouth, autoclave able, with aluminium screw cap and rubber liner. - Approx Capacity 25-28 ml. We manufacture Tubular and moulded Mccartney Bijou bottles for laboratories in glass. 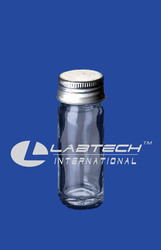 The tubular bottles are made of borosilicate glass with plastic screw caps. The moulded bottles are with aluminium screw caps. lotusoversea(.)com. Sizes are 7ml, 14ml and 28ml capacity. Media vaccine, narrow mouth with aluminium screw cap and rubber liner. Mac-Cartney Bottles, is made from borosilicate glass, complete with Aluminium Cap. Backed by a rich industry experience, we have become a renowned manufacturer and supplier of an optimum quality ranger of Mccartney Bottle. These are offered in varied sizes of 7 ml, 15ml, 30ml to make these suitable for diverse application. We also offer these with an aluminium cap to safeguard these from external impurities. Moreover, users can also easily clean these after use. Media vaccine, narrow mouth with aluminium screw cap and rubber liner. Capacity 28ml approx.